In 1873, Crowe had exhibited five pictures showing small incidents of modern life. They were widely admired, and The Times threw down a gauntlet by asking, ‘If even such subjects as … the halt of a hunting party for sherry and ale in front of a hospitable country house … can be made interesting by sincerity and conscientiousness of treatment, what fruit might not be expected from a deeper and tenderer or even more daring grasp of contemporary life?’ The following year Crowe obliged with a daring and unusual picture. The Dinner Hour, Wigan is one of the few Crowe paintings well known to modern art scholarship. It is one of the few paintings of his known to be on public display (it hangs on the wall of the Manchester Art Gallery, and an image and information is available on their website), which must account in part for its relative celebrity. It also has a straightforward, contemporary subject matter which appealed to 20th century critics in a way in which his earlier works, which demanded a knowledge of history or literature in order for the incident and its meaning to be fully appreciated, did not. Moreover, the painting was one of the clearest and most unsentimental pieces of social realism to appear in the 1870s, and indeed, was the first illustration of contemporary urban industrial life to appear on the walls of the Royal Academy. There was some public interest in the lives of the working poor by the early 1870s, fuelled in part by the illustrations appearing in The Graphic. Poverty and industrialism were themes in novels by Dickens, Mrs Gaskell and Benjamin Disraeli, among others, and the factory and coal mining areas of Lancashire could be visited by curious middle-class tourists. Nevertheless, Crowe’s decision to paint and submit a picture like The Dinner Hour was made without reference to the prevailing ideas on academic art. As can be seen below, he was roundly criticised by the Athenaeum writer for choosing such an unappealing subject, and the other critics, although commending his unsentimentality and truthfulness in producing a realistic and well-drawn piece, both considered the scene ‘unpictorial’ and ‘vulgar’. Crowe is not known to have had any family or personal connection with the north-west. 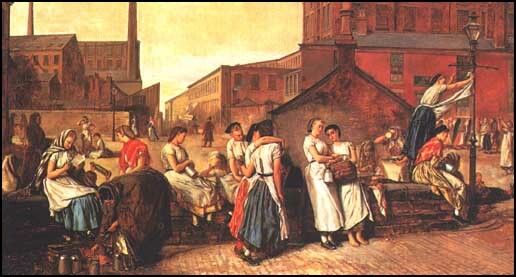 It is likely that the The Dinner Hour, Wigan, was inspired by a visit to the cotton mill shown in the picture – Thomas Taylor’s Victoria Mills in Wigan – during one of Crowe’s trips around the provinces in his capacity as an Inspector of Schools of Art. During the 1860s, he spent weeks or months of every year travelling. He took a great interest in the places he visited, and was known to have enjoyed being shown around factories and other industrial works. An entry in his diary, dated 28 October 1869, reveals that Crowe purchased shawls and petticoats used by working women at a Wigan pawnshop, and that he was already considering that ‘a good mysterious composition’ might be made of people coming out of the mills after a day’s work. It is unsurprising that Crowe should look around him for subjects for his paintings; and as can be seen in terms of his slavery paintings and some of the paintings produced in the previous decade, he was unafraid to tackle difficult, unusual or idiosyncratic topics. His interests and inclinations coincided with The Dinner Hour, Wigan. It has been noted in some twentieth-century criticism of the painting that the scene must have been slightly idealised for sensitive Victorian eyes. The women in the painting seem healthy and contented, a far cry from some of the scandalous stories about factory conditions of which most educated people would have been aware. Macleod (see below) considers that the placing of the factory girls outside the walls of the cotton mills allowed the poor conditions within the factories to be glossed over, to produce a painting conforming to the genre convention of the ‘happy worker’. She also states that Crowe was a member of the rich and privileged upper-middle classes, painting ‘rosy representations of mid-Victorian life’ because he was keen to see the existing social order depicted in the best possible light. This argument is let down somewhat by Macleod’s repetition of Graham Reynolds’ inaccurate description of Crowe (in Victorian Painting, 1966) as a ‘scion of Anglo-Indian Sahibs’, who was not dependent on his art for his income. In reality, Crowe often struggled financially, but chose to paint pictures which challenged convention instead of making money through trite ‘pot-boilers’. In addition, it has been noted by other commentators that the policeman, situated near the centre of the painting, symbolises the authority under which the girls worked; that the walls are high and forbidding; that one of the girls on the left hand side appears to be brandishing a bottle of alcohol; and that the prominent girl in the middle of the picture is both barefoot and the only figure to be looking directly at the viewer; all of which suggest in subtle ways that the viewer should analyse the real stories behind the apparently happy scene. Other modern critics, while acknowledging some idealisation, are united in their praise for the painting, noting its modernity, realistic detail, lack of ‘run-of-the-mill sentimentality’, and perception. The verdict of Julian Treuherz is that it is ‘the ancestor of the Northern townscapes of L.S. Lowry’; that of Christopher Wood, that it is ‘a unique picture in Victorian art’. The painting was purchased by Manchester City Art Galleries from A.E. Knight in 1922, after being sold at auction by Christie’s the previous year for just £3 1s 0d. It has appeared in a number of special exhibitions in Manchester, in 1938, 1968 and 1987, and was also part of exhibitions at Geneva in 1957, Lancaster in 1951, and Cardiff in 1970. Mr. Eyre Crowe sends, besides the capital Foxhounds in Kennel (1045), which we noticed last week, several other works which, although less valuable than that one, possess remarkable merits of their own. Still the style of painting adopted by the artist is much against his success, for it is hard, although firm, and, though bright, rather cold and opaque. One of these is The Dinner Hour, Wigan (676), a vista of a street, the topography of which, however unlovely it may be, is correct, with tall brick mills on either hand, their lofty shafts and bald walls being purplish red in sunlight; the pavement slopes before us to a lower level. On the wall which divides the one road from the other, are gathered many damsels, chattering away an interval of labour; one, leaning against a lamp-post, throws apples to her neighbours; another squats on the pavement, and takes a meal from a service of tin, two gossip as they loiter. The effect of the picture, rendering of light &c., is quite stereoscopic, but a photographer could have contrived as much; notwithstanding the local interest of the subject, we think it was a pity Mr. Crowe wasted his time on such unattractive materials. Without seeking for a dramatic motive, and without trying to harrow our feelings, Mr. Eyre Crowe has apparently set himself to record the unpictorial lives of the working classes of the manufacturing districts in a prosaic but entirely honest manner. In one picture (676) he shows us a score or so of factory girls at their al fresco dinner amidst the mills and chimneys of Wigan. Mr. Crowe shows us the Wigan lasses in their dinnerhour discussing the contents of their plates and basins in the open air. There is paintable material in this roughly picturesque Lancashire population, wearing, as they still wear, bright-coloured shawls and kerchiefs, mantilla fashion, instead of squalid bonnets, and healthy, lusty and happy as they look in spite of their labour in mill or mine, but it may be doubted if Mr. Crowe, one of the most literal if most honest of painters, be exactly the man to seize what grace or poetry may be latent in such life. There are few painters who more seriously endeavour to interpret their subject than Mr. Crowe. He is not afraid of reality, and does not shrink from scenes that less robust minds would consider vulgar. His method of interpretation is studious and faithful, observant of the truth without any temptation to display his mastery over facts by an emphasis of trivial incidents. His work lacks the highest inspiration which turns forms of nature into forms of grace, and still keeps them true. But his pictures are always interesting from the amount of earnest work they contain … Mr. Crowe has perceived and realised a part of the grace which can be found in this simple, untrained movement [of the factory girls], and his realisation has the merit of doing no violence to fact. The picture is not a mere romantic invention: it is a veracious statement, and in this quality alone it claims superiority over much of the work which surrounds it. I grew up in the 50s and 60s in Wallgate and used to walk past Taylor’s mill on my way to school up Miry Lane and Wallgate. I turned the corner by the New Star Inn every day, (the replacement of the pub in the picture) and I know exactly where the artist stood. I remember the mill girls coming out in their dinner hour covered in cotton, going to the fish and chip shops and sitting around having a laugh, before later making their mass exodus at five o’clock when the whistles blew. Taylor’s was the satanic mill at the end of my street, Mason Street, and I remember seeing it burning from every window during a major fire in the early 60s. The warehouse at the end of Wigan Pier is the building you can just see on the left.This is a fascinating picture on so many levels, and looks stunning when you see it for real in Manchester Art Gallery.